The Ford Mustang has been a top dog in the high performance world for almost 50 years now but one area where the factory stock Mustang has been criticized was handling – a critical point that has been resolved with the incredible 2013 Ford Mustang Boss 302. While the 2013 Ford Mustang Boss 302 isn’t the fastest or most powerful pony in the current Ford stable - ranging quite a bit under the 200+ mile per hour, 662 horsepower supercharged beast that is the 2013 Shelby GT500 – the 2013 Boss 302 is unquestionably one of the greatest models in the history of the Mustang. The 2013 Boss 302 is the most powerful Mustang ever offered as a standard production model (non-SVT, non-Shelby) thanks to its 444 horsepower Boss 302 engine while a refined suspension and braking system easily makes this one of the best handling Mustangs ever. On the outside, the 2013 Ford Mustang Boss 302 isnt all that different from a standard Mustang GT with the most noticeable changes up front being the lack of the large grille mounted fog lights from the GT and the three-bar Mustang logo from the original Mustang on the grille in place of the current running pony logo. The Boss 302 also has a more dramatic chin spoiler extending out away from the bottom of the front fascia and while the Boss has the circles that look like they should house the GT fog lights, these are strictly aesthetic fillers in an effort to save weight. The Boss 302 shares a hood with the 2013 Mustang GT with the new louvers running along either side of the hood but the Boss includes a unique striping package that starts at the front edge the hood – running back towards the cowl before flowing down over the side of the car to the fenders where the bold BOSS 302 logo is found. These stripes continue down to the lower rocker area where they run to the rear of the car, with these dark stripes punctuated by 19” painted black aluminum rims with a silver lip that are unique to the Boss. Across the back end, the 2013 Ford Mustang Boss 302 features a unique lower fascia with an integrated diffuser and a low profile rear spoiler, both of which are finished and a contrasting dark shade. Of course, the 2013 Boss 302 also has the gorgeous three unit LED tail lights that look black when turned off but light up brightly when activated – with a sequential turn signal operation adding that little extra bit of “cool factor”. Finally, the Boss 302 features unique exhaust tips that differ from the rolled tips on the Mustang GT with a trunk face badge that wears the three bar pony logo rather than the “GT” logo found on other models. The appointments made to the 2013 Ford Mustang Boss 302 are understated but they still serve to help the Boss stand out a great deal from the standard Mustang GT. Of course, the gorgeous Gotta Have It Green paint found on my new Boss test car goes a long way in making this car impossible to miss but there is no question that this is a car that turns heads – both of jealous guys and curious young ladies. There is just enough that changes on the outside to make the Boss unique without making it look too much like an aftermarket package, showing that “less is more” when designing a lightweight modern muscle car. 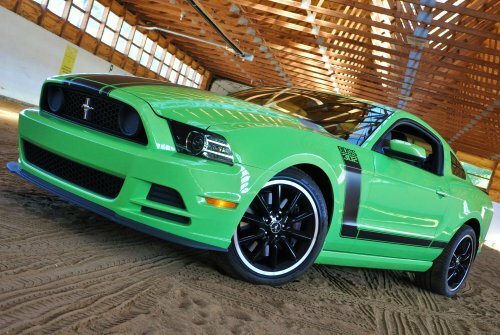 The 2013 Ford Mustang Boss 302 isnt going to wow anyone with high tech gadgets or a premium sound system. In fact, I don’t think that I had the standard stereo of the Boss on for more than a few minutes while driving the high performance Mustang as the rumble of the awesome Boss 302 exhaust system was all of the music that I needed. Keep in mind, the 2013 Boss 302 was designed to go fast so Ford has opted not to offer things like the weight-adding high end sound system, a touchscreen infotainment system or heated leather seats. Cloth sport seats are standard but my 2013 Boss test car was fitted with the Recaro race buckets sporting embroidered Boss 302 logos – a $2,000 option that I would call a “must have”. If you are really that concerned with having an upscale infotainment system, the Mustang GT Premium has you covered but if you are ok with a bare bones, “fast first” interior – you will be very happy with the Boss. As is the case with all of the Mustangs sold in the last, well, forever…the seating space in the back is a bit on the tight side but the 2013 Boss 302 with the Recaro race seats offers plenty of leg, elbow and head room for the driver and front passenger. The Recaro seats are as snug and gripping as they are good-looking with deep side and hip bolsters that you definitely “sit in” rather than some sport seats that you “sit on”. Best of all, these Boss 302 Recaro race seats have a generous amount of adjustability so that drivers tall and small can comfortably reach the controls for an awesome driving experience. The standard stereo sounds as good as any other basic automotive sound system but like I said before – the Boss exhaust sounds so awesome that I never wanted to drown it out with music. The HVAC controls are mounted just below the stereo in the center stack with a collection of good ol’ buttons and knobs controlling all of the interior features. The Boss 302 logo is embossed on the right side of the metal-finish dash that runs under a solid black dash cap. The short throw shifter is mounted in a center console that is located perfectly for the driver to go from resting on the center arm rest to grabbing the next gear with the vintage styled shifter ball. One area where the 2013 Ford Mustang Boss 302 does offer some high tech gadgetry is the suede wrapped steering wheel that has an array of buttons that handle the cruise control, the stereo system and the driver information center found in the gauge cluster. This extra display mounted between the massive vintage-styled speedometer and tachometer offers a variety of extra gauges that measure things like intake air temperature, air to fuel ratio and oil temperature but it also includes the Ford Track Apps – which include timers for things like braking distance, acceleration times (0-60, quarter mile) and a lateral accelerometer that records your top g forces under braking, turning and acceleration. The interior of the 2013 Ford Mustang Boss 302 is very simple but at the same time, it leaves very little to be sought after. The Recaro race seats look great and keep you snug during hard cornering for drivers ranging from under 5 feet to well over 6 feet tall. The interior is simple but it looks great and it does everything that it needs to do for Boss 302 drivers. The 2013 Ford Mustang Boss 302 is powered by a specially tuned version of the 5.0L Coyote V8 that is also found in the standard Mustang GT but thanks to a unique Boss 302 intake manifold and a special exhaust system that includes both side and rear exhaust tips – the Boss 302 makes 24 more horsepower than the Mustang GT. That unique exhaust system is actually one of my favorite features of the 2013 Boss and the second you turn the key and the Boss 302 V8 roars to life – it is clear that it has an incredible exhaust system. There are four exhaust tips with two exiting out the back like the Mustang GT exhaust system but the Boss also features an extra set that exit just behind the doors. These tips do not extend out or down far enough to see them but they provide an awesome amount of rumble at idle and at wide open throttle. I’m going to throw this out there – and I mean no offense to those Corvette, GT500 or Camaro ZL1 owners reading this – the Boss 302 has the best sounding factory exhaust system available on the market today. In fact, it sounds better than a great many aftermarket V8 exhaust systems that I’ve heard and this is one aspect of the Boss for which Ford should be applauded. Truth be told, I’m sure that the Boss that I drove for a week got worse gas mileage than it should have simply because I couldn’t get enough of revving the engine and hearing the sweet symphony of angry American muscle. Unlike some performance cars that have more bark than bite, the 2013 Ford Mustang Boss 302 is way more than just a great sounding muscle car. The Boss is available only with a proper 6-speed manual transmission mated to a nice, stiff clutch that really helps the driver make the most of those 444 horsepower while still being comfortable when dealing with traffic. The clutch is a little stiffer than some less sporty models but considering the aggressive transmission and rear differential gearing; driving the Boss isn’t a chore like it can be with some other sports cars. Finding gears is very easy as the short shifter seems to guide the car into the next gear, even when twisting the 5.0 to higher RPM. This is a car that can comfortably be a daily driver (one with some serious power) but more importantly – it’s got big power that allows you to really rock and roll on the drag strip or the road course. When you launch hard from a stop, the 2013 Ford Mustang Boss 302 will very willingly turn the back tires into molten rubber and smoke with the help of a set of 3.73 gears but with only a touch of clutch manipulation, the Boss will bite and roar away from a stop. Shifting hard from 1st gear to 2nd will take the tires to task, effortlessly spinning them a little more before gripping and ripping you up past the 60mph mark. As you rocket through 3rd and 4th gear at wide open throttle, the Boss roars just like a muscle car should with acceleration capabilities that will hurdle the Boss through the quarter mile well into the mid 12 second range. A good hard launch that results in a great 0-60 time and quarter mile time is great but that is something that the mighty Mustang has become known for. Where the Boss truly shines from behind the clouds of negativity surrounding the American muscle car is when it hits the twisties. The 2013 Mustang Boss 302 is fitted with a unique adjustable suspension system that not only gives the Boss a lower, more aggressive stance than the Mustang GT but it also allows this Mustang to handle better than any other non-SVT developed Mustang in the last 50 years. The Boss feels solid and confident in long, higher speed turns while also providing responsiveness in tight turns that will blow your mind. The Boss is a little stiffer under normal driving circumstances than some other performance cars but this slight loss of ride comfort is a very fair trade when you consider the incredible handling capabilities of the beastly Boss 302. This system also allows adjustability that I, sadly, did not get a chance to tinker with but for those Boss buyers who want to really get the most out of their new limited edition Mustang on the track – the Boss 302 allows fine tuning of the suspension system for the driver’s specific needs. Finally, a Brembo brake package helps the Boss stop on a dime and with the high performance quality of this system – the Boss 302 will stop hard over and over and over without facing some of the fading issues of lesser exhaust systems when pushed to their limits. The 2013 Ford Mustang Boss 302 has the highest tech suspension system of any non-SVT Mustang to ever roll off of a factory assembly line with the most powerful naturally aspirated V8 Ford has ever packed under the hood of a Mustang – two facts that make the 2013 Boss 302 not only one of the most entertaining Mustangs I’ve ever driven but it is also one of the most exciting cars I have ever had the pleasure of piloting. The Boss handles like a dream, exceeding all expectations in that category while still offering the straight line performance that you would expect from a modern Mustang. On the outside, the Boss features changes that are more functional than cosmetic but they are perfect – allowing just enough difference to help the Boss stand out in a crowd of Mustang GT coupes. If you love American performance cars and you love driving – I would be hard pressed to name another car that I would recommend before the 2013 Ford Mustang Boss 302. Sure, the Shelby GT500 might pack more power and more overall performance but it does so at a premium price. The Boss, on the other hand, starts in the low 40s so the price is similar to that of the Mustang GT Premium except where the GT Premium packs impressive power and plenty of higher end goodies inside like leather, a premium sound system and an elaborate navigation system – the Boss puts function over form with only what you need inside and everything that you want under the sleek, muscular body. 444 horsepower and a track tuned suspension system make this one of my favorite cars of all time and I bet that if you drive one – you will feel the same way. I bet that as soon as you turn the key and fire up the Boss 302 V8 engine, the exhaust note will inspire you to unleash this beast and once that happens – you might as well start filling out those finance papers. The only bad news pertaining to the 2013 Ford Mustang Boss 302 is that 2013 is the final year for this incredible package. When Ford introduced the modern Boss for the 2012 model year, the company stated that it would only run for two years so after the end of the 2013 model year production – the new Boss will be gone. That being said, if you want your chance to experience this piece of rolling American performance car history, contact your nearest Ford dealership to see if they have one to check out. I promise that you won’t be sorry. Check out my gallery of the 2013 Ford Mustang Boss 302 at rest in an equestrian arena in the gallery on the right by clicking any of the thumbnails. I recently bought a 2013 boss laguna seca in black & I must say this car is 100% BADASS!. I sold my 2012 corvette grand sport which I find the boss to be more exciting to not only drive but owning is as much fun. this car is such a head turner I get compliments constantly by strangers every time I take it out for a drive. The quad exhaust sounds amazing and is so intoxicating. the car commands a ton of respect from everyone I talk to & it already seems to possess legendary status. Got one too... 2013 Laguna Seca BOSS 302, real happy with it, and still have gotten to 6600 RPM! !